The house welcomes you with comfortable rooms which were restored and renovated using natural local materials (as stone and wood), perfectly according to the rules implemented by the bioclimatic architecture, but also in the strict respect of the local traditions and the rural culture. The house, at its origin, residence of the sharecroppers and a part of it, place of storage for the seasonal agricultural produce and also shelter for the facilities and the tools used for the cultivation of the land, is located in an unique position, on a rocky spur, over the famous rupestral construction of the so-called “Castello” (The Castle) of Cava d’Ispica. 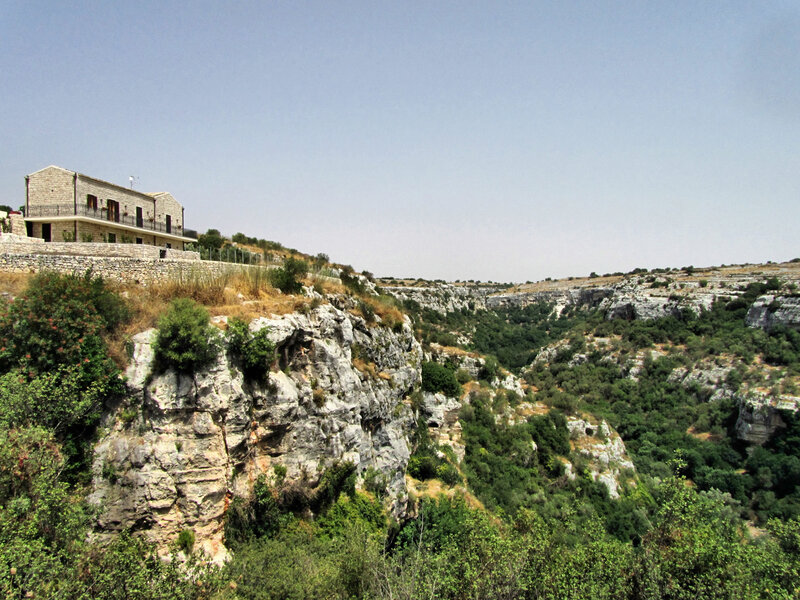 “Casa al Castello” was built in 1954 and was meant to provide decent life conditions to the countryside peasants which used to live inside the rocky caverns of the so called “Castello” even in the early post second world war period. 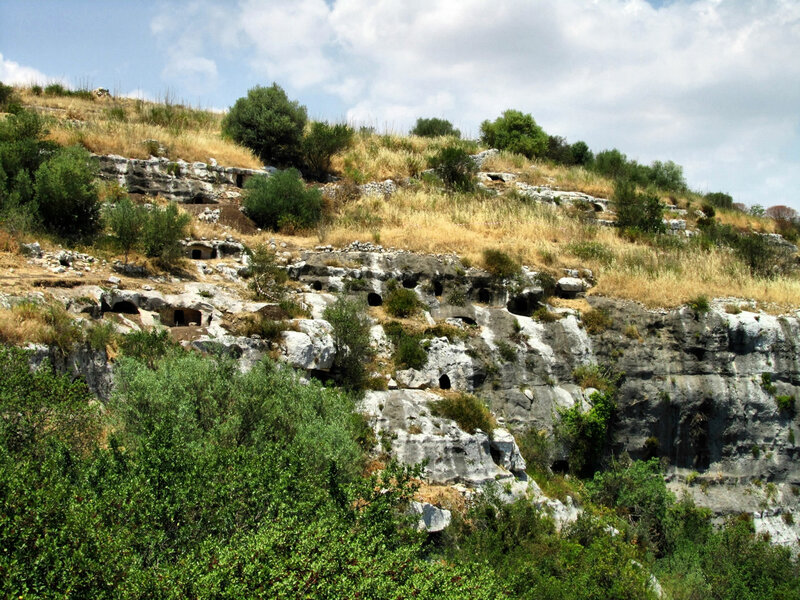 The background of this scenery is the famous cave, a majestic and picturesque valley characterized by the typical Mediterranean vegetation (“macchia”); the cave is an archaeological area sprinkled with various testimonies that sustain the continuity and the evolution of the human being during the centuries: prehistoric necropolises, christian catacombs, rupestral oratories and various dwellings. Between the last ones, there is the aforementioned “Castello”, a residential complex, several storeys high, connected between them by interior steps cut in the walls, with cavities permitting the climbing. 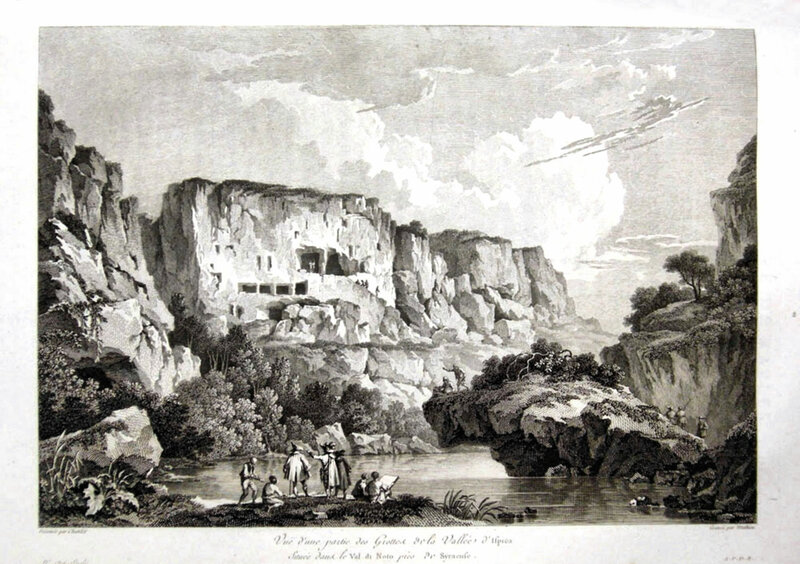 This “Castle” is represented in a picture of the 18th century by the famous French painter, sculptor and architect J. Houel, picture included in his well-known collection “Voyage pittoresque des isles de Sicile et de Lipari”, that can be admired at the Hermitage Museum in San Pietrosburg and at Louvre Museum in Paris. 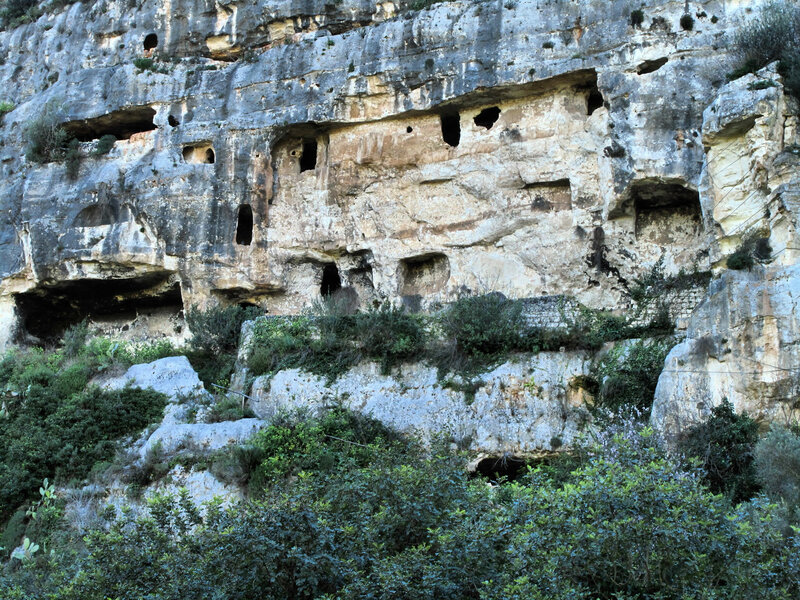 Little distant from our house is the prehistoric necropolis of Calicantone, dated from the Antique Bronze Age (2200 - 1400 b.C.) 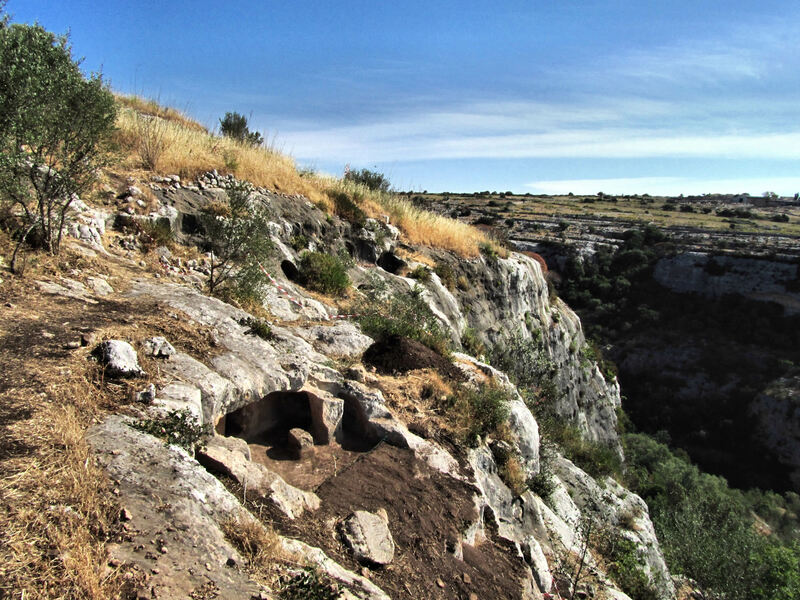 that includes almost a hundred of graves dug in the wall rock, some of them placed even inside overhanging rocks; most of the graves’ front drops are decorated with columns, pillars and ledges. 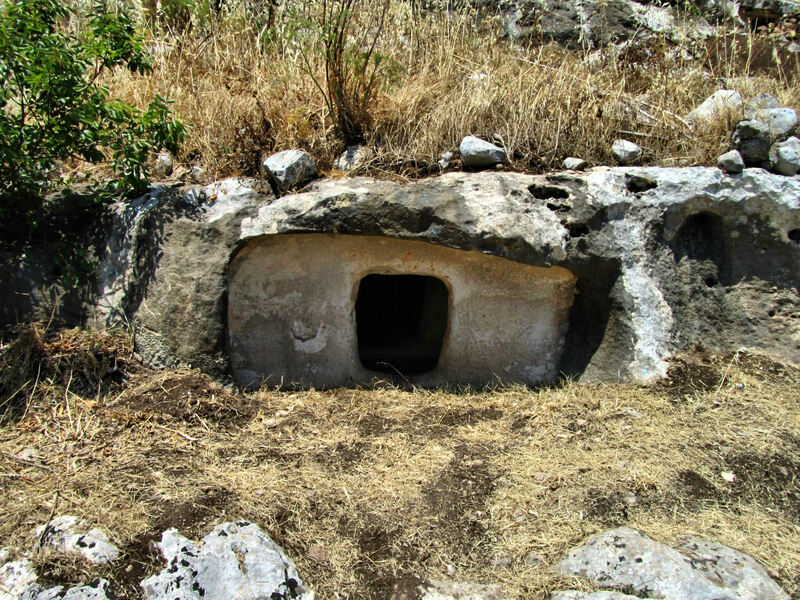 One of the most monumental grave of the necropolis, the so called “The Prince’s Grave” includes an entrance, then a sort of small antechamber that preceeds the death cell (crypt), a 2 meters long room. This grave‘s got a hip-roof supported by pillars. This incredible scenery, immersed in a silent and magic atmosphere far away from the overwhelmed daily city life, is worth being entirely discovered by you. Here, you can abandon yourselves during a peaceful walk along a contemplative path of the place and you can discover again what does the slow-living really mean. Choosing this place and staying in our guest house will revive you, turning you away from the obssessive rythms of the daily life.